Extended Area Service, or EAS, is when telecommunications companies "extend" a local calling area. What it boils down to is you can call certain areas that were previously long distance calls as if they were a regular local call. 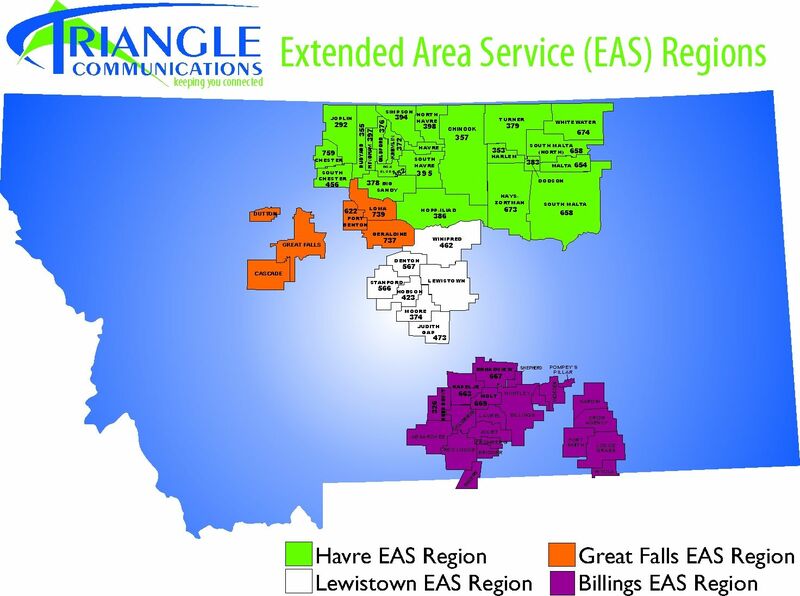 Triangle Communications has four EAS areas in our service territory. These areas are: Havre, Great Falls, Lewistown and Billings. Triangle offers two options for subscribers in EAS areas. The first is the Unlimited EAS, which lets you make unlimited calls within your extended local calling area with no per minute charges. The Unlimited option does cost a bit more in the monthly service rate than the second option, Measured EAS, because it does allow unlimited calling in the EAS area. Measured EAS is where you pay a low per minute fee for outgoing calls within the extended local calling area. Calls within your same exchange, for example, 353-xxxx to 353-yyyy, are not charged a fee. With the Measured EAS, there is a capped amount you are charged for the EAS calls. Once you reach that amount, you are not billed for additional calls within your EAS area. Calls outside of your extended calling area are still long distance and will be billed by your long distance carrier.